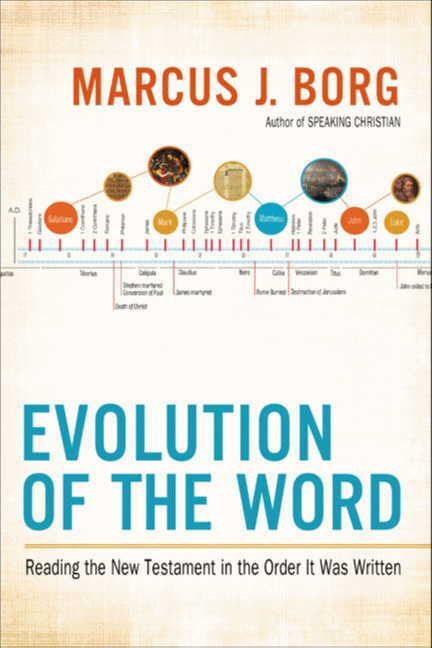 In Evolution of the Word: The New Testament in the Order the Books Were Written (HarperOne, New York, 2012), scholar Marcus J. Borg presents the books of the New Testament in chronological order. In an attempt to demonstrate the development of the early Christian concept of Word, both the Word of God (Jesus Christ) and the Words of God (the writings of the New Testament), Borg re-orders the writings of the New Testament into the order he believes they were originally written. Beginning with thirty pages of introductory material on the chronology of the New Testament, the context of the early followers of Jesus, and the historical and literary context of Paul, Borg sets the stage for the writings of the New Testament. The New Testament then follows in this order: 1 Thessalonians, Galatians, 1 Corinthians, Philemon, Philippians, 2 Corinthians, Romans, Mark, James, Colossians, Matthew, Hebrews, John, Ephesians, Revelation, Jude, 1 John, 2 John, 3 John, Luke, Acts, 2 Thessalonians, 1 Peter, 1 Timothy, 2 Timothy, Titus, and 2 Peter. The text of each book is that of the New Revised Standard Version (1989), with standard chapters, versification, section headings, and NRSV textual notes. Preceding each book are some brief remarks by Borg, including some explanation for his dating of each respective work. In this way, The Evolution of the Word looks somewhat like a NRSV New Testament, simply re-arranged according to Borg’s chronology. I purposefully say “Borg’s chronology” for a couple of reasons. 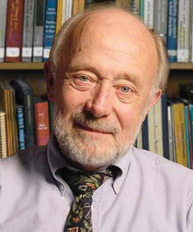 First, while he correctly notes that the majority of New Testament scholars affirm that the canonical order of the New Testament does not represent the order in which those books were written, Borg’s dating and ordering of these writings are firmly his own and not that of a “scholarly consensus.” One truth of contemporary New Testament Studies is that little consensus exists concerning the compositional dating of New Testament books. What little consensus there is, Borg unfortunately bends to his purposes. For example, the majority of scholars would date the Gospel According to Mark around 65 CE (+/- a few years) and many (but certainly not all) affirm that Matthew and Luke relied upon Mark in the composition of their gospels. Yet when Borg notes Mark in his introduction, he dates it to 70 CE and presents as undisputed Matthew’s and Luke’s reliance upon Mark’s gospel. While his statement is not necessarily incorrect, Borg’s presentation of his view as “the consensus” is misleading. Second, Borg’s chronology and dating of New Testament writings is solidly within a scholarly camp that gave rise to the Jesus Seminar, a position that has long been problematized by wider scholarship. For example, scholars (especially those aware of textual criticism) have for decades seriously questioned how New Testament writings such as the Pastoral Epistles (1-2 Timothy and Titus) could have been written so late (post-100 CE in Borg’s view) and a) been used by early Christians such as Clement of Rome pre-100 CE, b) be attested to so uniformly in the textual tradition, and c) have been so widely accepted by the Church and viewed as authentic letters of Paul. This is not to say that there are not responses to these sorts of arguments (though personally I find such explanations wholly unconvincing and at odds with a good deal of historical evidence); rather, this is to underline the fact that in Evolution of the Word Borg offers his arguments and assumptions as settled fact. This is a useful rhetorical device, to be sure, but far from useful in terms of critical thinking and serious scholarship. Borg’s first three chapters effectively provide summaries of his views on New Testament Studies, the Historical Jesus, the relationship between Second Temple Judaism and early Christianity, and the Historical Paul. Given Borg’s background, readers Evolution of the Word should not be surprised to find that his perspective on these fields is very closely aligned with that of the Jesus Seminar and the liberal theological project more broadly. This background leads to a conception of an early Christianity which is starkly different that the form traditionally conceived out of the New Testament canon. At times Borg does offer valuable insights; his historical contextualization of Paul, the Pauline Epistles, and the early churches which received them accurately represents and summarizes the context of the first century church and is very useful. The introductions to the writings of the New Testament are basically sound, though (as noted above) concerns with Borg’s dating of certain New Testament writings leads to a certain level of discontent with his overall chronology. The most serious concerns with Evolution of the Word are Borg’s presentation of opinion as settled fact (a long-noted tendency of the Jesus Seminar crowd) and the lack of accountability which reinforces the first concern. There are no references, footnotes, endnotes, citations of other works (scholarly or otherwise), no suggestions for further reading or any way to fact-check Borg’s presentation. Given the claims being made in this book, especially the important disagreements that scholars have about some of these issues, Borg would have been better served providing some external references for his claims. Serious New Testament scholarship should involve historical inquiry which does not bow to ideology – in this case, a position which needs to postulate significant “theologizing” and unhistorical additions to the Jesus story by the early Church in order to fit the “facts” of Christianity into their philosophical presuppositions. The criticisms of the Jesus Seminar need not be further repeated here; rather, we again note that this work fits firmly within that mindset, and must be approached accordingly. This book is a really great idea – it’s just done from a particular and, frankly, rather small (though vocal) perspective, which makes the usefulness of this book questionable at best. Evolution of the Word is thus not recommended for its intended general audience, and should rather be engaged by those already introduced to the contours of New Testament Studies and the important conversations which are being had about issues which Borg glosses over or to which he assumes answers.